There is always a wonderful feeling when you finish a project that has been in the works for a while. 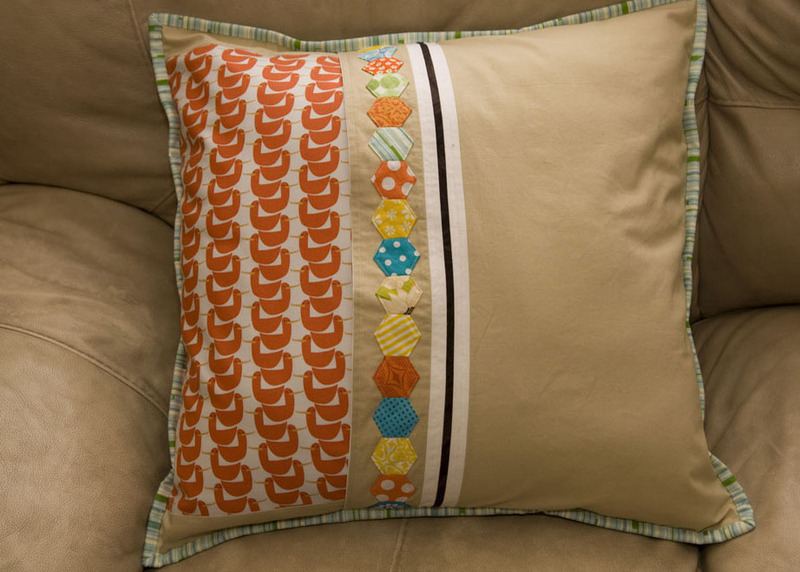 This pillow was no different. This is where all those hexagons where headed. I'm truly happy about how this pillow turned out because I had some serious doubts. As I started sewing my strips of hexagons together I was really wondering about my fabric choices. I just wasn't sure the combination was going to work out, but I figured I was stuck in the car for another 6 hours so I might as well just keep sewing. I'm so glad I did. When we got home, the hexagons were put aside for a couple weeks, but I pulled them out last week and finished this guy up. It's meant for the living room, but I admit I'm a little worried about putting in reach of three crazy kids. I really love it. Again, the pattern is in the first issue of Fat Quarterly e-magazine. My quilt group would be proud of me. I hand-stitched this binding which is not my norm. Doing the binding on the machine is much easier, but this definitely looks better. 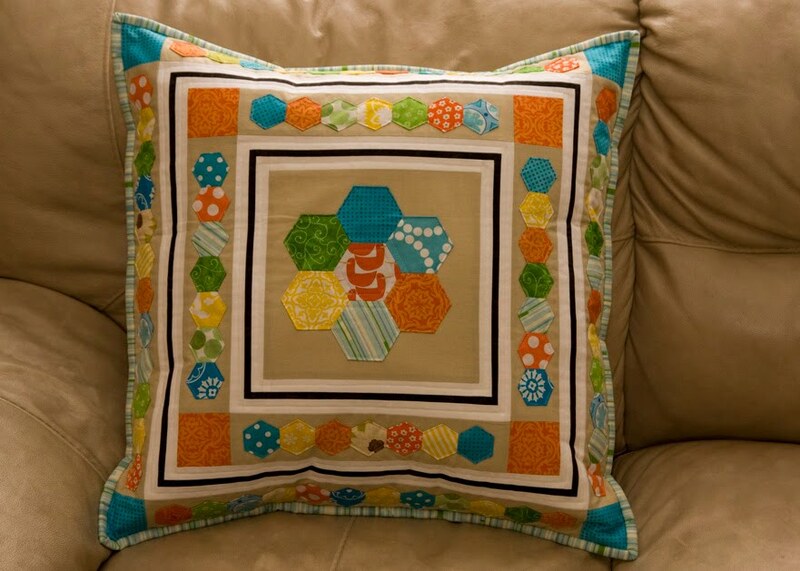 Another fabulous and unplanned thing is that it perfectly fits the large pillow form I made a while ago. I just switched the covers. 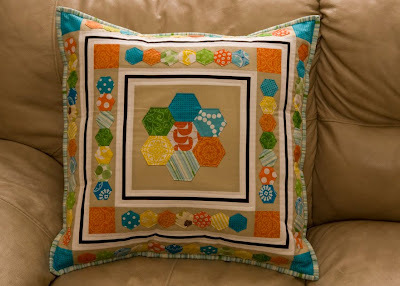 I have another pillow cover in the works and three more in my head. 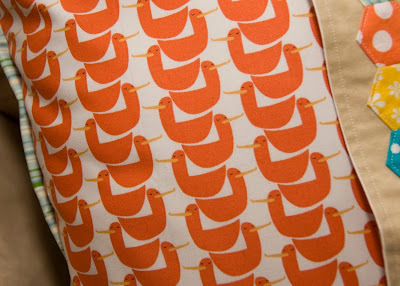 Pretty soon I'll be retiring my red and brown covers for new, summery bright ones. Although, once again, no one told the weather it's supposed to be summer. It is snowing again this morning. 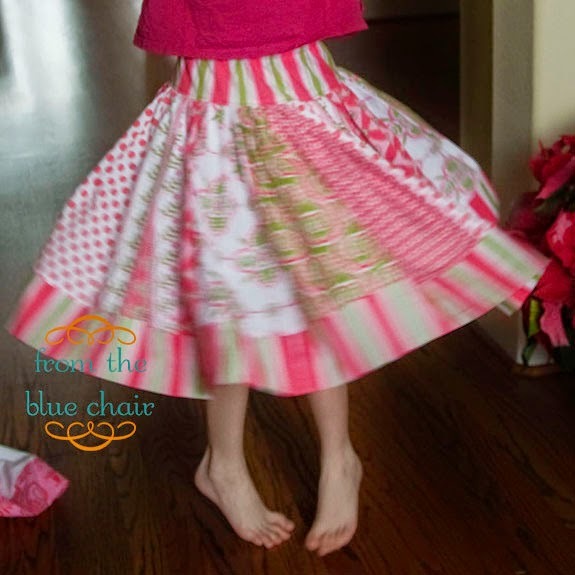 The Twirly Skirt Pattern is ready to download! 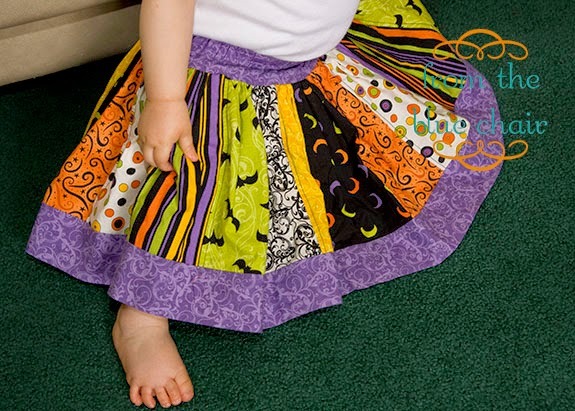 Thanks to those who helped out with it and sent in pictures of their cute skirts. 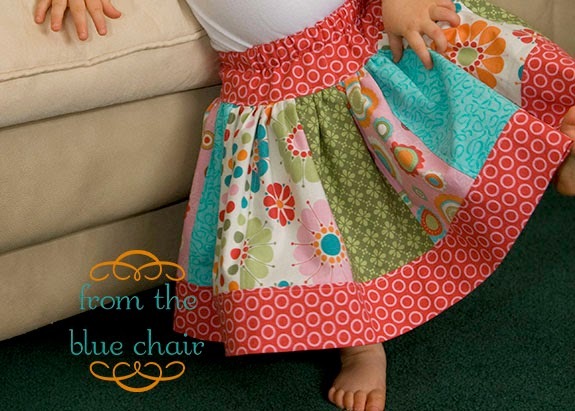 Please let me know if you have any questions on the pattern. 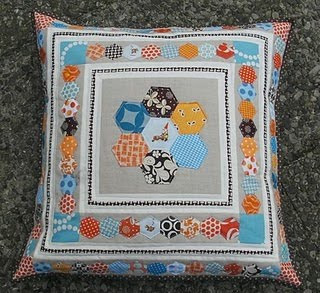 This pattern is now available only on Craftsy. 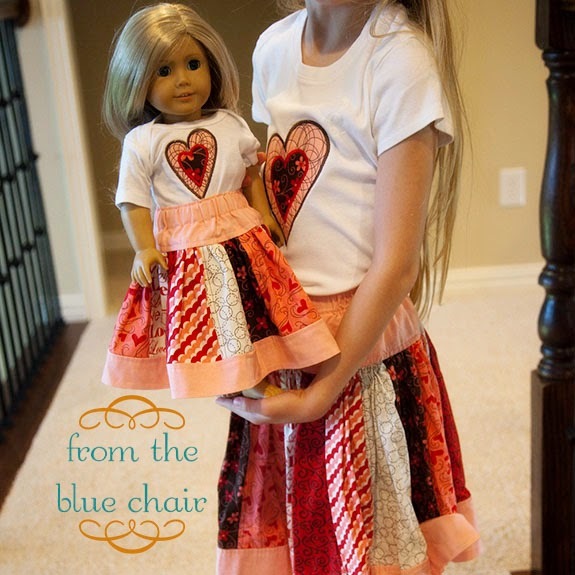 Please download the pattern here. Thanks for your interest in this pattern. Let me know if you have any problems. Disclosure: This post contains Craftsy affliate links. 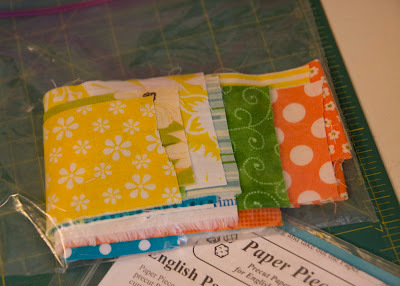 This is a bit of a how-to post regarding for paper piecing. 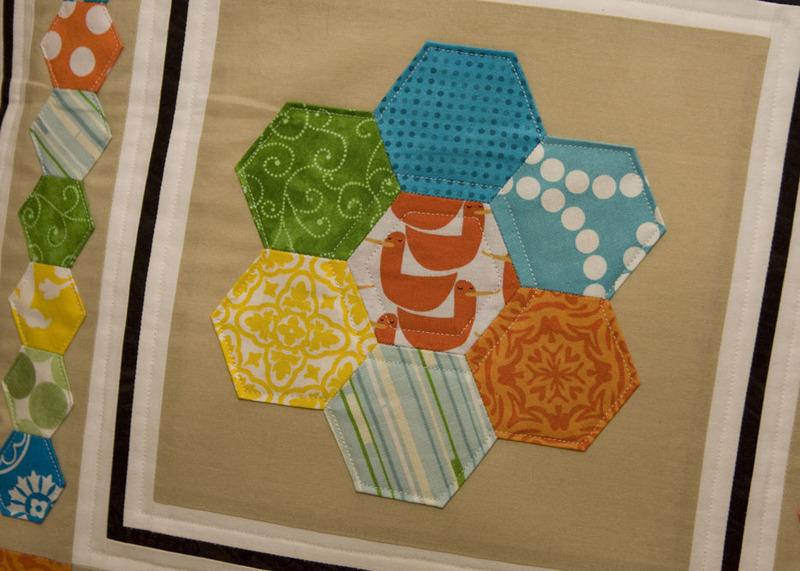 I just recently finished piecing a bunch of hexagons for a pillow in the works. I have seen people do it a couple different ways. This is how I was taught. 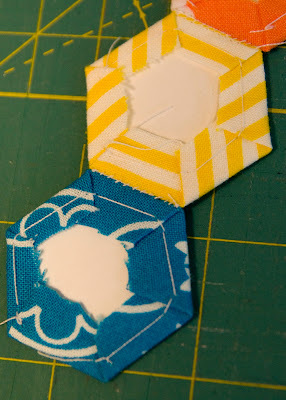 Fold sides over one at a time and baste in the corners. They can be sewn into all sorts of arrangements. Here is a youtube video that shows how this is done. It's a different technique than I learned, but the end result is the same. 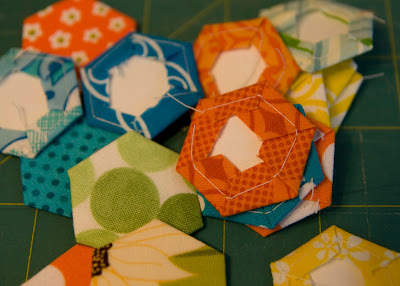 I was using 3/4 inch hexagons (each side measures 3/4 inch). 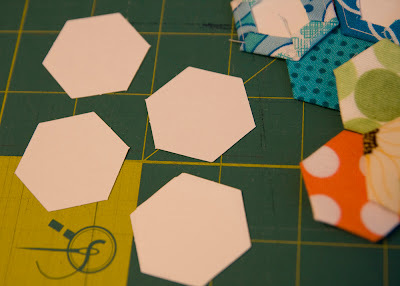 My paper shapes are from paperpieces.com. 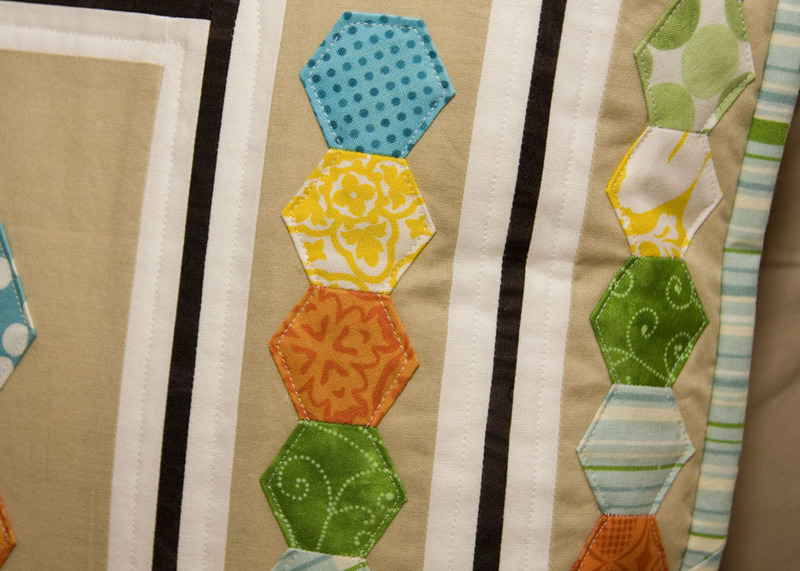 One of our local quilt shops carries these, but you can also order them online. I just cut strips of fabric to take with me on the trip and cut of squares as I went.